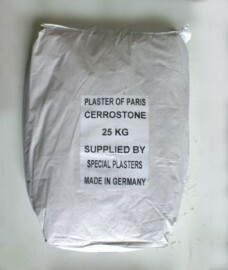 Cerrostone Plaster is a fine particle medium strength plaster which has been formulated especially for "running" or strickling. (Producing a profile or pattern by drawing a profile template over the setting plaster.) For this purpose a plaster with an early start of set but gradual slope is needed and low expansion. Can also be used for running in situ and carving. Plaster/Water ratio: around 1.4kg/Litre.